A study by University College London found home environment was the main cause of emotional eating. And this was due to parental behaviours including giving upset children their favourite food to soothe them. 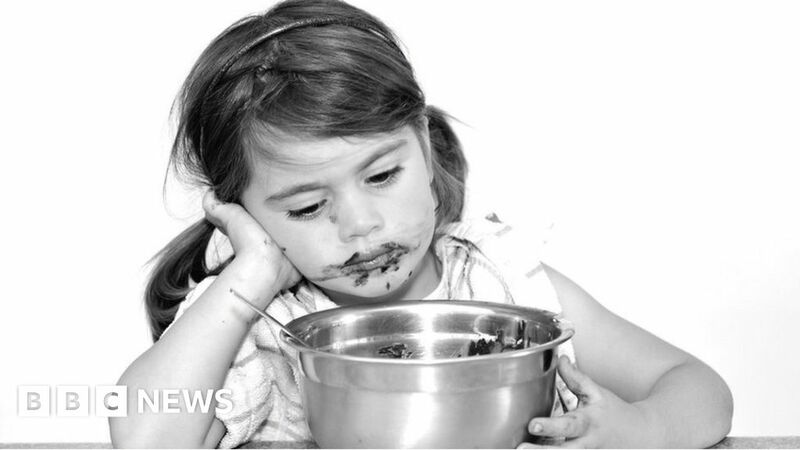 But eating-disorder charity Beat says parents shouldn’t be blamed for children’s eating issues. Emotional eating “indicates an unhealthy relationship to food”, said senior lead researcher Dr Clare Llewellyn. “Rather than finding more positive strategies to regulate their emotions, they’re using food,” she said. “A tendency to want to eat more in response to negative emotions could be a risk factor for the development of obesity. And emotional over- and under-eating could be potentially important in the development of eating disorders such as anorexia nervosa or binge-eating disorder. Parents reported on their children’s eating traits and tendency to emotionally eat – answering questions such as whether the child wanted to eat more when irritable or less when sad. They compared the questionnaire data between identical and non-identical twins along with their rates of emotional eating and found very little difference between the twins whether they were identical or not – suggesting environment had more of an influence than genes. The researchers said their new work was “significant” because it added weight to the results of a bigger study they had carried out last year with a totally different twin sample. “The trait is starting to develop in the important formative pre-school years. And it indicates there is scope for giving parents more directed advice about sorts of strategies they use to help their children when they’re upset during the very important early years when behaviours start to develop,” said Dr Llewellyn. The researchers said emotional eating was an “enduring trait” that could continue through your life. “The advice to parents would be try not to use food to soothe your child. When they’re upset, try to use other more positive strategies,” said Dr Llewellyn. “We will continue to research the home-environmental factors that might play a role in emotional eating, such as certain parental feeding practices or stress around the dinner table,” said Moritz Herle, who co-led the research. But Beat said it was important parents were not blamed for children’s eating issues. “Eating disorders are complex mental illnesses and never have one sole cause,” the charity said. “Previous research shows that some people’s genetic make-up makes them more vulnerable to developing an eating disorder. And for these people, stress or emotional upset may act as a trigger.